Instructor Corey Briggs (far right) instructs students in last year’s Hazardous Waste Operations and Emergency Response training course. Fall River, MA-based Apollo Safety, Inc., is once again a sponsor of the class. Apollo Safety, Inc. a veteran-owned, Fall River, Mass.-based company specializing in safety products and services, recently announced it would again be a sponsor for University of Rhode Island’s College of the Environment and Life Sciences’ Hazardous Waste Operations and Emergency Response training course for the 2014 spring semester. As part of its sponsorship, Apollo Safety is offering the university a discount on various safety and health equipment and products for the class. In addition, Apollo Safety’s technicians will donate their time to preventative maintenance and calibration services for hazardous materials air monitoring equipment. “We’re in the business of safety products and preventative services. Many times, despite taking precautions, situations arise that require the need for specialists to figuratively and literally come in and put out fires. As a company based in Fall River, which is a stone’s throw from Rhode Island, we are happy to invest in tomorrow’s safety, health, and environmental professionals,” said John V. Carvalho III, president of Apollo Safety, Inc.
For last year’s class, Apollo Safety deeply discounted safety equipment purchased for the class and also donated a variety of safety equipment, including chemical protective gloves and suits and respiratory protection equipment. The 13-week course is taught by Corey Briggs, CIH, CET, a senior manager at ENVIRON International Corporation’s Boston Office and a 1980 URI graduate. 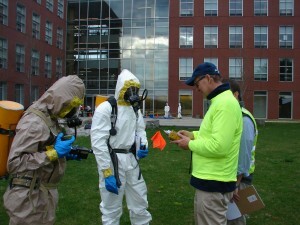 In this course, Briggs and his team of instructors train students to safely anticipate, recognize, evaluate, and control the various hazards and risks that may be encountered at hazardous waste sites and during hazardous substance emergency responses involving hazardous substances spills and releases. The course also provides a wide variety of technical and practical information for those students wishing to eventually work in an EH&S role for the private and public sectors.